Hey Guys! Sorry if this is not the appropriate forum, or if this has been done already (I found no related posts). Long story short, I have the Iris Pro on the 15" Macbook (Mid 2014 with dGPU) partially working on Windows 8.1. I created a triple boot installation (Mac, Win 8.1, Arch Linux), patched Grub to fake the "booting-into-os-x" procedure, and forced the iris pro 5200 driver installation on windows. I have tried uninstalling the nVidia card drivers and something weird happens after windows load, looks like there's a secondary screen, with a different resolution to the right of the "main" screen. I can move the mouse and everything, but I can't log in. If I disable the nVidia card, I just get a black screen after windows load. Any ideas? Suggestions? I was thinking maybe I could get my hands dirty with nVidia CUDA and code an applet to manage this stuff. I'm good with C/C++ but I don't know if that's possible at all. I can reveal more details if you want. I was thinking, maybe it's possible to completely disable the nVidia card from the Grub EFI console. Does anybody have any experience with that? Have you seen this post: Win7 x64 booting natively via EFI (no BIOS emulation) - Page 42 - MacRumors Forums? And tried their tool? I was gonna test it later today.. I changed the nVidia driver in the Device Manager for it to use the Microsoft Basic Display Adapter. After the reboot, I was able to see the color I chose for the login screen. I tabbed twice, typed in my password and managed to get into the windows desktop! At first, it was using some type of "extended virtual desktop", but I managed to tweak some settings in the screen resolution applet to make the Color LCD my main desktop. I'm also able to reach the Intel Graphics Control Panel. Actually, I found the hint to do this on those pages! Haven't had the chance to compile his code but I'll give it a go, I'll keep you updated! So keep those updates comming! I'll Probably need some help around here! So far I can boot to Win 8.1 using the Intel Iris Pro driver (5200) hooked to a "Virtual Display". Looks like the LCD panel is still hooked to the nVidia card with a Generic Driver. Iris Pro is working Flawlessly in Gentoo - Arch. I Got it to Work!! 6. Set your grub boot drive as your default in OS X startup disk applet. 7. Modify grub.cfg and compile your new bootx64.efi bootloader. 11. Start windows from grub loader. ¡WARNING! This process will require you to wipe out your hard drive, you might get it to work with pre-installed systems but I haven't had the chance to do so. As of now, brightness is not working on bootcamp, I'll need to research the issue. 1. Create a Win 8.1 EFI bootable flash drive using Rufus. 2. Create an Arch Linux bootable flash drive using Rufus. 3. Create a OS X Yosemite bootable flash drive using createinstallmedia. 4. Boot your computer using the Win 8.1 install flash drive. 5. When you get to the Windows install screen, press shift+F10 to get to the MS Shell. 8. Once in Windows, click on start menu then type "cmd"
14. Close disk utility and install OS X in there. 15. Boot into OS X. 16. You'll now have both Windows 8.1 and OS X installed in EFI Mode, now you'll need to install Arch Linux. 17. Boot your computer into the Arch Linux installation USB. 18. Launch the Arch Console. 19.1 Select your keymap by typing "loadkeys keymap_file (available keymaps are located in /usr/share/kbd/keymaps)"
19.8 Mount your root partition on /mnt and your first boot patition on /mnt/boot/efi (You'll need to create this folder). "swapon" your swap partition. 19.10 Edit the /etc/pacman.d/mirrorlist and comment out any unnecessary mirrors. 19.11 Execute the following command "pacstrap /mnt base"
19.13 Generate your fstab file by issuing the following command: "genfstab -U -p /mnt >> /mnt/etc/fstab"
19.14 "chroot" into your newly created environment by typing this command: "arch-chroot /mnt /bin/bash"
19.15 Uncomment the needed locales in /etc/locale.gen, then generate them with: "locale-gen"
19.17 Create a new initial RAM disk with: "mkinitcpio -p linux"
19.18 Set your root password with "passwd"
19.19 Create a new user for yourself with the following command: "useradd -m -G wheel <username>"
19.20 Set password for your user with "passwd <username>"
19.21 Upgrade pacman db with "pacman-db-upgrade", allocate the repositories with "pacman -Syy" and Install the sudo package with "pacman -S sudo"
19.22 Add your newly created user to the sudoers file located in "/etc/sudoers"
19.23 Switch to your newly created user with "su <username>"
19.24 Go into your user home directory "/home/<username>"
19.25 Install packer dependencies with "sudo pacman -S base-devel fakeroot jshon expac git"
19.26 Create a new directory to download pkgbuild "mkdir pkgbuild"
19.27 Install wget and vim with "sudo pacman -S wget vim"
19.28 Get into the pkgbuild directory and run "wget -c https://aur.archlinux.org/packages/pa/packer/PKGBUILD"
19.30 Install the newly created package with "sudo pacman -U packer-*-pkg.tar.xz"
19.33 Run "tar xvzf grub-git.tar.gz"
19.36 If everything went fine, then you're ready to install and configure grub. First thing you'll need to do is tweak the "/etc/default/grub" file and add "libata.force=noncq" to the GRUB_CMDLINE_LINUX_DEFAULT parameter, it should end up looking like this: GRUB_CMDLINE_LINUX_DEFAULT="quiet libata.force=noncq"
19.37 Install grub with the following command: "grub-install --target=x86_64-efi --efi-directory=/boot/efi --bootloader-id=grub --recheck --debug"
19.38 Generate your grub configuration file with the following comand "grub-mkconfig -o /boot/grub/grub.cfg" (This should reconize your vmlinuz images and your Windows installation). 19.39 If everything went well, go to your / and create a new mountpoint for your extra boot partition (e.g. sudo mkdir /loader). 19.40 Mount your patition there, switch to that folder. 19.41 Touch a file named "mach_kernel"
19.42 Create the following path inside the folder: "System/Library/CoreServices"
19.44 In that same directory, generate your boot.efi image by issuing the following command: "grub-mkstandalone -o boot.efi -d /usr/lib/grub/x86_64-efi -O x86_64-efi /boot/grub/grub.cfg"
19.45 Reboot into OS X. 19.46 Mount your extra boot partition with diskutil "sudo diskutil mount /dev/diskXsY"
19.48 If everything went well, restart your computer holding the option key. You should be able to reach your arch installation by selecting the "efi boot" Volume and Arch Linux from the grub boot menu. 19.50 Reboot into OS X, select the new EFI Volume "Arch Linux" as your main disk in the Startup Disk Applet. 19.54 Once you're back in grub, click the "c" key to enter the console, type the command "apple_set_os" in the prompt. 19.55 Click "esc" and boot into windows, You should be able to see 2 display adapters!!! Special Thanks to Andreas Heider and Tre87! That's a great job! Would it be possible to automate this? Patch the bootloader without installing Linux? It would be great to develop a tray icon for Windows, so we can switch between nVidia and Intel gpu. I was thinking about that last night! Maybe if we compile this script as a grub module or executable file. I don't see any linux specific functions in the code. I'll give it a shot later! Another bug I found is that Hibernate/Sleep isn't working correctly in Windows. Maybe the "null" driver get's installed based on the computer firmware or something. so has somebody with a rmbp with gt 750 already tried this one with an egpu? Or have you been successful with your iMac? Could this lead to enabling optimus with discreet gpu MacBooks? Has anyone tried yet? 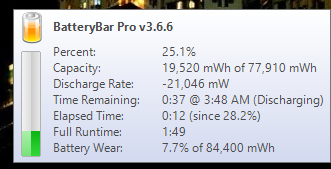 That is what I'd suggest users with this machine try to do even without having an eGPU to gain extra battery life. Optimus will power down the dGPU when not in use using the much more efficient iGPU to drive the LCD. Notebookcheck found idle of the Iris Pro model to be 7.6W (MacOSX) compared to 17.4W of the GT750M model under bootcamp. That's a HUGE 10W difference. 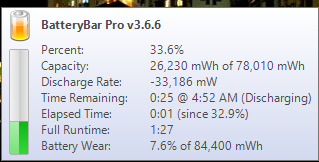 So if the machines sat idle, the 85Wh battery would see the Iris Pro model would get 11.2hrs of battery life while the GT750M would get 4.8hrs, less than half! Did you ever manage to automate any of the bootloader stuff? I would be willing to try with my 750m/akitio setup but some of the steps in arch go above my head. It would be nice to finally have some conclusive proof of Optimus working on a 750m model. Download it from releases, install refind, sudo mount -t msdos /dev/disk0s1 /efi, copy apple_set_os.efi to /efi/EFI/custom/apple_set_os.efi. You should then see an entry for apple_set_os.efi in refit. Before you boot Windows, just quickly start that, which will flash the screen while it runs and then just boot Windows. 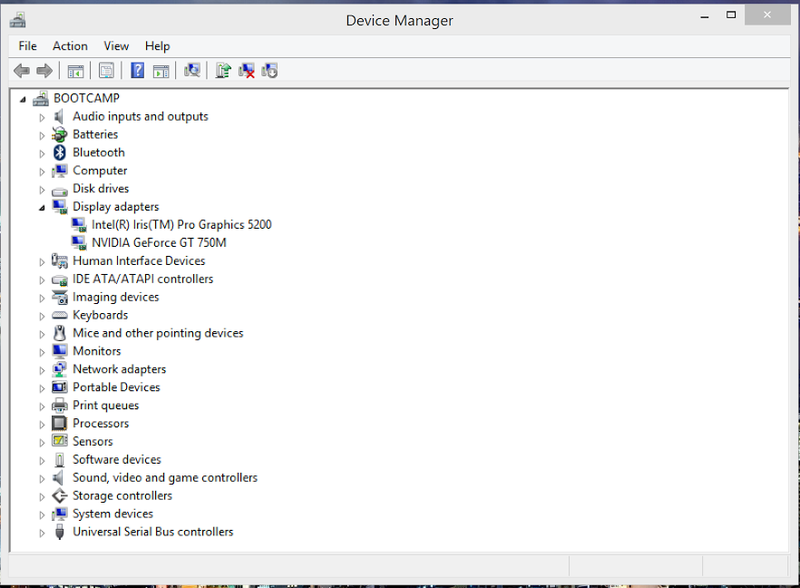 This enables the Intel GPU so it's visible in the device manager. No more grub/Linux required. (To clarify, this disables the hiding of the Intel GPU and makes it appear in the device manager, nothing else. NVIDIA could still remain your primary GPU). There is now also a Windows version of gpu-switch at https://github.com/0xbb/gpu-switch, which you can use to set the primary GPU for the next boot. I just tested it and was able to use the Intel GPU, but booting with both GPUs active and the NVIDIA driver installed often gives me black screens after booting. I have no idea why, when I uninstall the NVIDIA driver it works perfectly, I just see two displays, one for each GPU. For some reason reFit would always freeze in the EFI shell after running apple_set_os.efi. I tried using reFind and that was the solution! @Evo* do you think it might be possible to activate optimus internal LCD mode? Firstly, check whether your NVidia control panel Manage 3D section to see if you now have a "Preferred graphics processor" option along with a list of programs you can choose this for like shown here. Then run say Resident Evil 5 benchmark comparing the result when running on the GT750M versus when the iGPU is enabled. I'd be very much interested in someone confirming that the iGPU works. Another way of testing if the iGPU is activated and working is to use batterybar software to measure idle power consumption on battery. With the iGPU enabled and driving the internal LCD, idle power consumption be noticably lower. Here are a few benchmarks. Iris does surprisingly well. Would you mind installing batterybar, booting the system up with each gpu as primary, pulling AC power anf checking the reported battery duscharge at idle? Iris should be noticeably lower making this iris switched mode desirable for on the road battery life. 750M adds another 58% power consumption at idle. Though your 21.05W with the iGPU is still far higher than the 7.6W notebookcheck recorded under OSX that I describe here. Consider applying the tweaks at http://forum.techinferno.com/hp-business-class-notebooks/2537-12-5-hp-elitebook-2570p-owners-lounge.html#post38399 to see if can get it nearer to that 7.6W figure. It's rather crude and probably won't work if you want to use the NVIDIA GPU at all, but maybe it decreases power consumption. Also, did you have any issues with black screens at all? What software/versions are you running? The 750m is definitely still consuming a lot of power while the Iris is active, even while "disabled". Brightness control isn't functioning as well, and it appears to force 80-90% brightness at all times. Perhaps I'll try that GMUX driver and see if it makes a difference. I used the windows version of gpu-switch + apple_set_os.efi + reFind 0.87 to boot Windows 8.1 (bootcamp install). No issues with black screens. @ah- Do you know how I would go about using the Optimus.dmg tool described in this post with apple_set_os.efi? Could I patch reFind with whatever EFI tweaks are inside the dmg? My main purpose for trying to get the Iris working is to unlock optimus internal LCD output on discreet gpu macbooks. I think it would be extremely useful to everyone if we could conveniently enable it. I looks like Optimus.dmg is the old grub implementation of apple_set_os.efi, which does exactly the same thing as apple_set_os.efi, just as a grub command instead of a standalone EFI application. You don't need both, one is enough and I think apple_set_os.efi is the better implementation. In particular since less can go wrong, like grub not finding stuff. I'm a bit surprised to see that it does anything on systems without a dedicated GPU, but who knows what exactly Apple does.